Even though the southern Cook Islands were spared from severe coral bleaching in the recent large-scale global bleaching event, the El Niño in 2015/16, we experienced bleaching this year in the Aitutaki Lagoon. 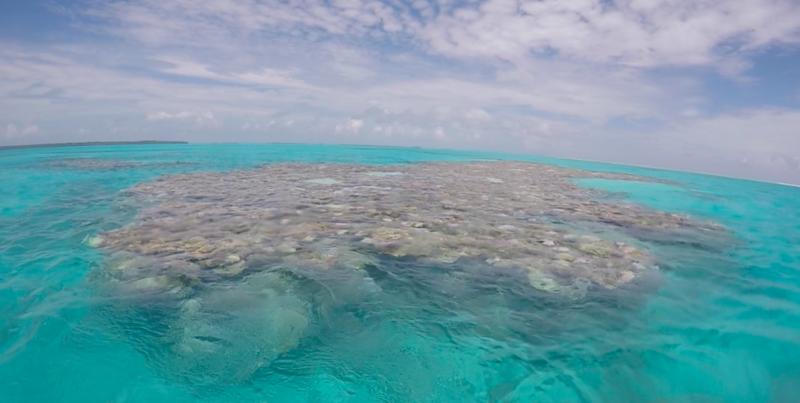 In the Aitutaki Lagoon the first bleached corals have been observed as early as November 2016. Surface water temperatures recorded at that time were still around the 28°C margin. 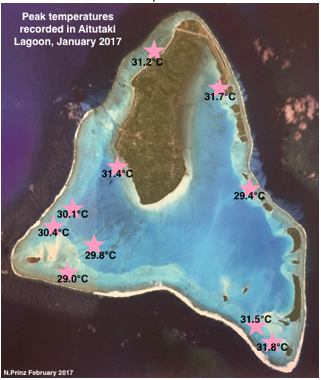 In December temperatures rose to over 30°C throughout the lagoon and peaked in January 2017 with over 31°C. This was also when we experienced a sudden fish kill on the 12th January. In the month of February, temperatures seemed to slowly decrease to around 29.5°C. 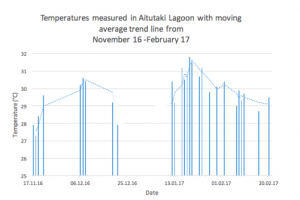 The following graph represents measurements from the last months, and the trend line clearly indicates the increase in temperature towards the hottest month of the year, January (summer and rainy season in the Cook Islands). Between 22nd December 2016 and 11th January 2017 no measurements were taken. 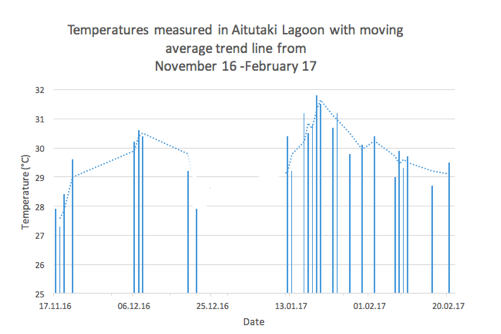 We recorded daytime water temperatures in the range between 27.3°C and 31.8°C in the lagoon environment. 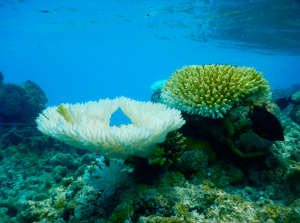 Coral reefs represent less than 0.1 % of the world’s ocean area but support approximately 25 % of all marine fish species and the livelihoods of around 500 million people. As air and sea temperatures have been rising at an unprecedented rate within the last century, scientists predict a 60% decline of corals by 2040 globally. 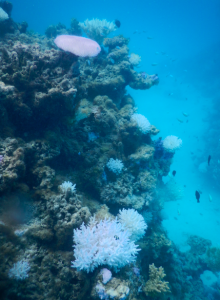 The rapidity of climatic changes is problematic for tropical marine ecosystems, therefore scientists predict major degradation of coral reefs around the planet. The map on the left gives a spatial idea of maximum temperatures recorded across the lagoon. Over the course of the dry season temperatures were predicted to remain around the 30°C margin and therefore bleaching might persist until temperatures drop again. It is suggested to continue monitoring throughout the months of dry season to assess the state of coral bleaching and recovery. 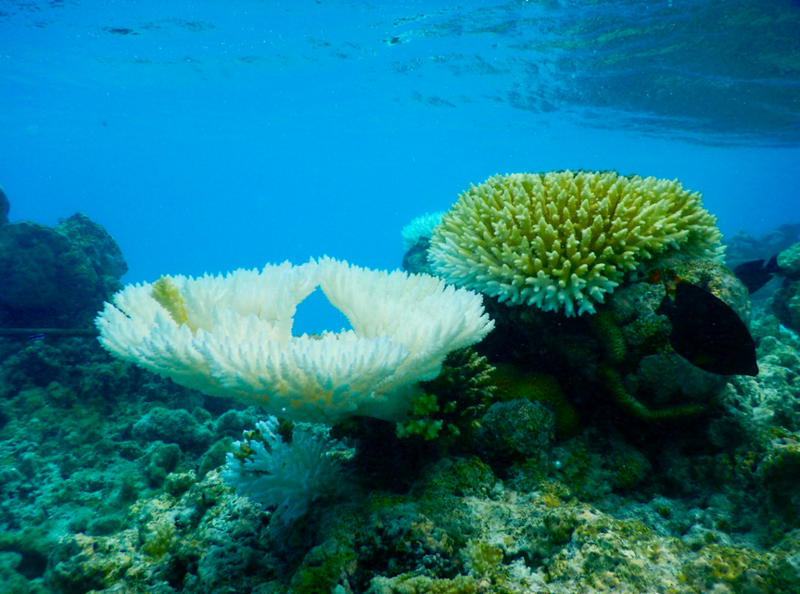 At the same location as in the pictures above, a coral is observed bleaching within the hottest month. 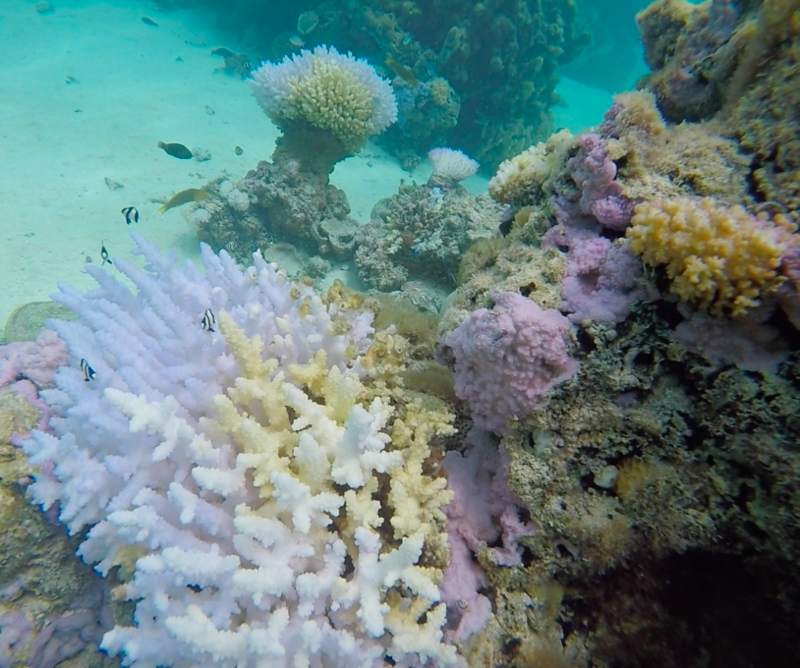 On the left all three stages of coral bleaching can be seen; the pink tissue is still alive but bleached, the part in the top centre is a recently-killed part of the colony that has lost its tissue, and the left corner is a part of the colony that has been killed several months before and is covered by algae. On the right the entire colony is dead and is beginning to be covered by algae. Aitutaki, Cook Islands, coral bleaching, El Nino. Bookmark.